Community Gardening for Idiots-back home: Foodie Penpals - black is the new black! A black cube emblazoned with the logo Black was   the first thing Ms Tagalong zoned in on. Dark          chocolate coated chili liquorice –a combination       made in Danish heaven! She counted out the            lozenges dusted with salmiak and chili powder,         fifteen days supply if she rationed them out carefully and probably hid them from Mr Ideasman. An exquisite wooden butter knife was next to be     examined. Something which will find its way back to Australia, for sure. Swedish Pepparkakor biscuits are still sitting in their bright red box waiting for a happy occasion, maybe  Christmas? Lovely to have with cheese maybe. MsTagalong did her best trying to decipher the writing  on  the box but had to resort to looking at the          pictures! Looks like they are spiced with ginger,     cinammon, clovesand fenugreek. Yum. A little pot of home-made traffic-light chutney, so    named from the different pepper colours and a little bottle of bourbon flavoured gourmet sauce were      also in this wonderful box. Thank you Gareth, says Ms Tagalong. Pia Schmedt who was so lucky to have Ms Tagalong as a foodie penpal has sent in a little post about her parcel as she saw it! This month I was lucky enough to receive my foodie penpal parcel from Meryl, who lives in Dorset. She sent me different kind of products, some I know and some I don't know and had to look up on the internet. It was the nuts &breadsticks for the Romesco sauce, which I didn't know,   but found out that it is a nut and red pepper-based sauce from Tarragona, Catalonia, Spain. You can serve it with seafoods, which is perfect, because guess what, I live at the North Sea just 1km from  the ocean and we eat a lot of fish in our family. The other thing I had to look up is the tagine spice from Morocco, it is used for the slow cooked meals in a traditional Moroccan tagine pot. One of the best items was the Paella seasoning, because my family loves Paella and I will use this seasoning  the next time I cook this dish. Then there were the oatmeal & honey cookies from a local company, which were delicious and disappeared quickly together with the yummy lemon & ginger tea. But the BEST the absolutely BEST were the real ale chutney together with the cheese bites and the rosquellitas (savoury biscuits, which are so delicious that I have to find a store, where I can buy them or a recipe to make some myself). 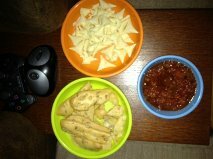 I had some tomato chutney left and my husband and I had the perfect evening snack!!! Meryl sent me a lovely card from the Biddulph Grange Garden in Staffordshire.